The MH230TPR features:A range of up to 23 miles under favorable conditions, 22 channels, each with 121 privacy codes for 2,662 combinations, Dual power: 10 hrs. Alkaline (3AAA) or 8hrs. NiMH, 11 weather channels (7 NOAA) with alert and scan feature, iVOX hands-free communication without the need of an audio accessory, QT (Quiet Talk) interruption filter, Backlit display, LCD battery meter, Battery save feature, Audible low battery alert, Keypad lock, 10 call tones, Time-out timer, Priority scan, Mini-USB charging port. Includes: 3 radios, 1 dual drop-in charger, 1 charging adapter, 3 belt clips and 3 NiMH battery packs. 3 earbuds with PTT microphone. Available in bright yellow. 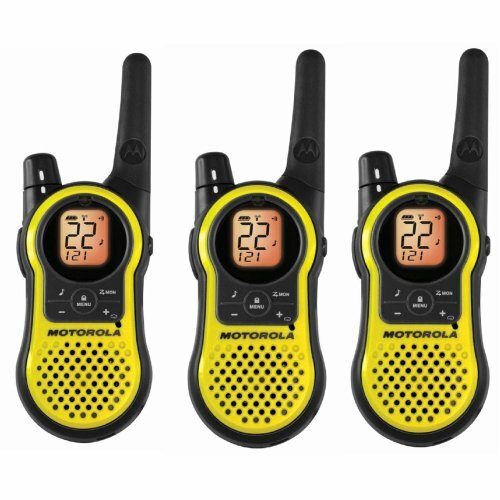 If you have any questions about this product by Motorola Consumer Radios, contact us by completing and submitting the form below. If you are looking for a specif part number, please include it with your message.